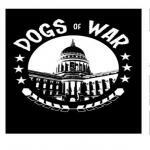 Dogs of War is a groundbreaking band that is a transcendence of Rock and Hip-Hop. The five-piece collective is a true hybrid that takes pride in utilizing the talent and diversity of their band. Dogs of War consists of two award winning emcees Tefman and Samhain Bane from the veteran Hip-Hop group The L.O.S.T S.O.U.L.S, backed by three incredibly skilled musicians in Anthony Salas (guitar/lead vocalist), Dustin Harmon (bass/sound engineer), and David Payne (drums). The band plays loud, and they have a lot of fun doing it. Their self-titled EP was released on January 3, 2015. If you're looking for something new musically, I suggest you experience the new sounds of Dogs of War!